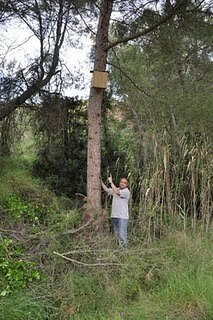 Albet i Noya along with the assessor Xavier Bayer, biologist and specialist from Penedés on these mammals, has hung up the first nest boxes with the aim of favouring the population of some of the 15 species of bats that live in Subirats. In the Can Simón estate (municipality of Canaletas) a ruined house will soon be rehabilitated to house a large colony, for summer (upstairs) and for winter (basements), a real luxury hotel for these little animals that are strictly protected and thanks to the ecological wines of Albet i Noya and fortunately even more so throughout Penedès, are not poisoned by insects contaminated by insecticides. The nest boxes that are hung on trees substitute the old trees that no longer exist, which had been their natural habitat during spring/summer, and they can be made using the already used wooden wine boxes giving a very ecological second use to this packaging material. 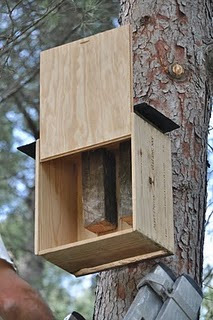 Openings are made in the boxes to the bats can access them and little beams are added so they can sleep during the day. As night falls the bats go out to hunt as this grape moths fly and will be eaten up by the bats, therefore reducing its population and facilitating control by other means, which reduces the grape damage caused by the so called moth, which is the main cause of botrytis or rot fungi in grapes. This method is successfully in the USA in plantations of cotton, corn, coffee etc...and also in the Delta del Ebro, to control rice and where in just one night the bats can eat up to 600.000 moths in just one rice field. According to Carles Flaquer (researcher at the Natural Museum of Granollers) the "soprano bat" (Pipistrellus Pygmaeus) one of the most abundant species in Subirats, can eat up to 132 moths in a night and other, more voracious, can eat up to 1.000 insects in an hour.